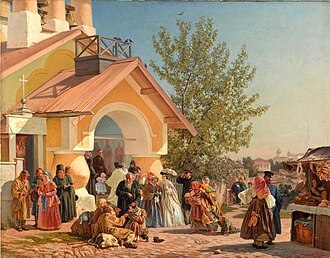 Tsar Alexander II bows to his people from the Kremlin's Red Porch. The splendid Red Porch or Red Staircase (Russian: Красное крыльцо, Krasnoe Kryltso), decorated with stone lions, leads into the Palace of Facets in the Kremlin, Moscow. In old Russian the word krasny meant "beautiful", but today it means "red". This is the same word used for "Red Square". 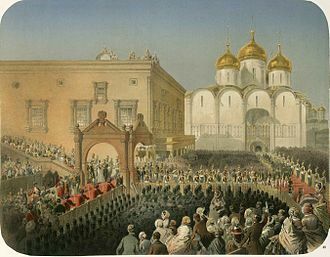 On the morning of his coronation, the Tsar was met at the Red Porch, where he took his place beneath a large canopy held by thirty-two Russian generals, with other officers providing additional support. Accompanied by his consort (under a separate canopy) and the imperial regalia, he proceeded slowly toward the Cathedral of the Dormition, where his crowning and anointing would take place. 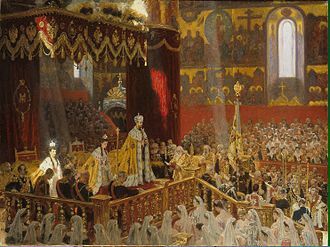 After the service, the Emperor and Empress proceeded under canopies back to the Red Porch of the Kremlin, where they rested and prepared for a great ceremonial meal at the Kremlin's Hall of Facets. 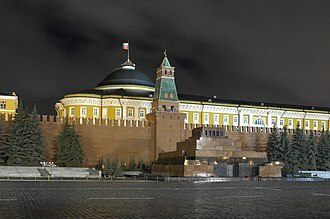 During their procession back to their Kremlin palace, later rulers (starting with Nicholas I) stopped on the Red Staircase and bowed three times to the assembled people in the courtyard, symbolizing what one historian has called "an unspoken bond of devotion" between ruler and subjects. In the 1930s the porch was destroyed, and its place was taken by an unimpressive Kremlin canteen. 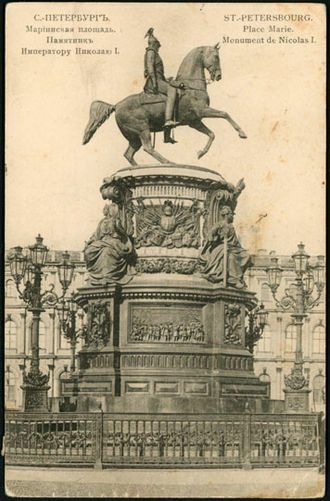 In 1994 the Red Porch was the first of Moscow’s monuments to be restored. Coordinates: 55°45′1″N 37°37′1″E﻿ / ﻿55.75028°N 37.61694°E﻿ / 55.75028; 37.61694. The Cathedral of Vasily the Blessed, commonly known as Saint Basils Cathedral, is a church in the Red Square in Moscow, Russia. The building, now a museum, is known as the Cathedral of the Intercession of the Most Holy Theotokos on the Moat or Pokrovsky Cathedral. It was built from 1555–61 on orders from Ivan the Terrible, a world-famous landmark, it was the citys tallest building until the completion of the Ivan the Great Bell Tower in 1600. 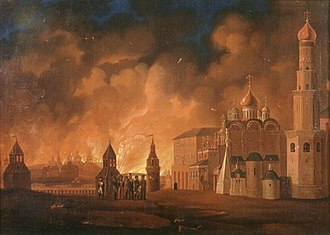 The building is shaped as a flame of a bonfire rising into the sky, Dmitry Shvidkovsky, in his book Russian Architecture and the West, states that it is like no other Russian building. Nothing similar can be found in the millennium of Byzantine tradition from the fifth to fifteenth century. A strangeness that astonishes by its unexpectedness and dazzling interleaving of the details of its design. The cathedral foreshadowed the climax of Russian national architecture in the 17th century and it was completely and forcefully secularized in 1929 and remains a federal property of the Russian Federation. 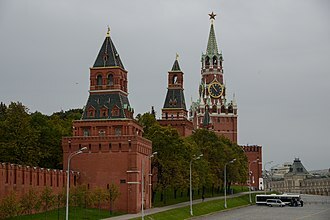 The church has part of the Moscow Kremlin and Red Square UNESCO World Heritage Site since 1990. It is not actually within the Kremlin, but often served as a metonym for Russia in western media throughout the Cold War. The site of the church had been, historically, a marketplace between the St. Frols Gate of the Moscow Kremlin and the outlying posad. The centre of the marketplace was marked by the Trinity Church, built of the white stone as the Kremlin of Dmitry Donskoy. According to the report in Nikons Chronicle, in the autumn of 1554 Ivan ordered construction of the wooden Church of Intercession on the same site, one year later, Ivan ordered construction of a new stone cathedral on the site of Trinity Church that would commemorate his campaigns. Dedication of a church to a victory was a major innovation for Muscovy. 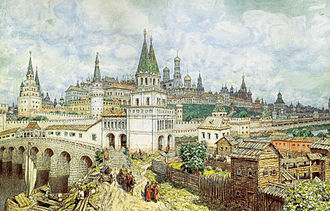 The placement of the church outside of the Kremlin walls was a statement in favour of posad commoners. 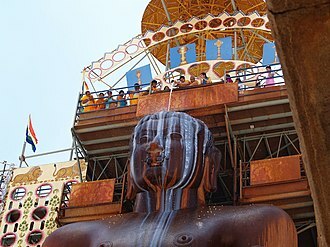 And the builder was Barma with company, the identity of the architect is unknown. 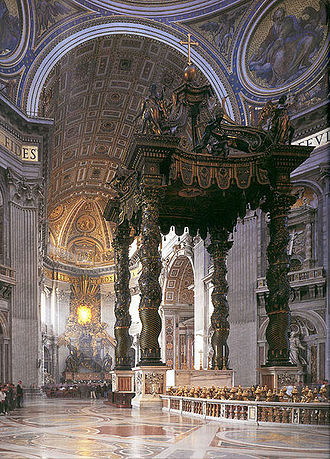 A baldachin, or baldaquin, is a canopy of state typically placed over an altar or throne. A cloth of honour is a simpler cloth hanging vertically behind the throne, Baldachin was originally a luxurious type of cloth from Baghdad, from which name the word is derived, in English as baudekin and other spellings. 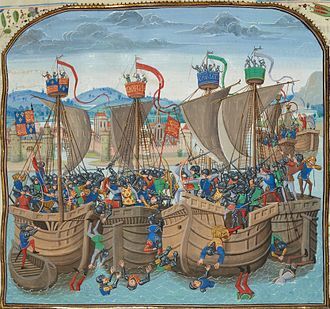 Matthew Paris records that Henry III of England wore a robe de preciosissimo baldekino at a ceremony at Westminster Abbey in 1247, the word for the cloth became the word for the ceremonial canopies made from the cloth. In the Middle Ages, a canopy of state, cloth of honour, or cloth of state was hung above the seat of a personage of sufficient standing. 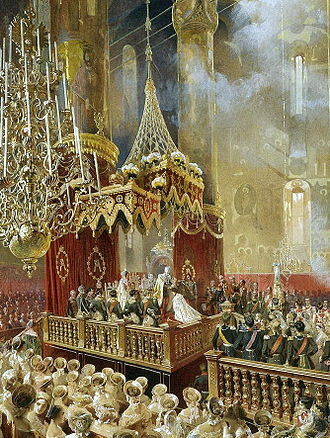 The seat under such a canopy of state would normally be raised on a dais, the cloth above a seat generally continued vertically down to the ground behind the seat. 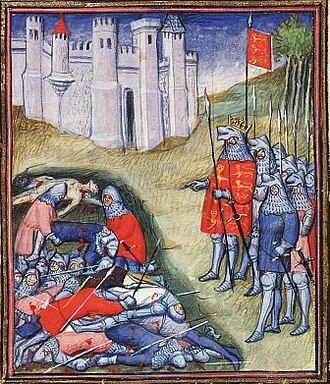 Emperors and kings, reigning dukes and bishops were accorded this honour, in a 15th-century manuscript illumination the sovereign Grand Master of the Knights Hospitaller in Rhodes sits in state to receive a presentation copy of the authors book. His seat is raised on a dais and backed with a richly embroidered dosser. 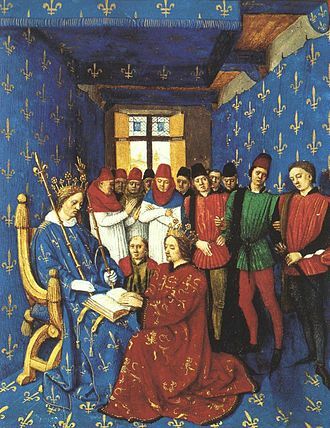 Under his feet is a cushion, such as protected the feet of the King of France when he presided at a lit de justice, the King of France was covered by a mobile canopy during his Coronation, held up on poles by several Peers of France. 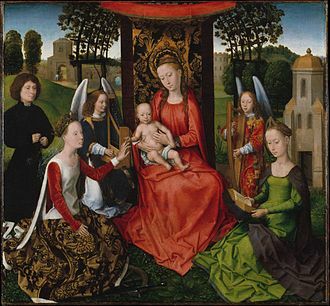 The Virgin Mary in particular, is often shown sitting under a cloth of honour in medieval. The cloth was simply a luxurious textile, often imported and with rich patterns, as in brocades. 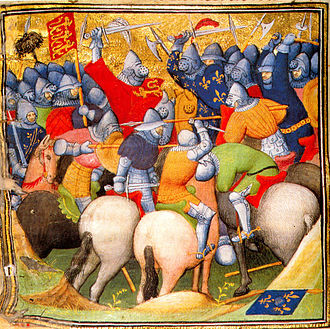 French kings are shown with blue cloths patterned with the gold fleur-de-lys. The coats-of-arms embroidered or woven into the tapestry are of England, sometimes, as in the presentation miniature Jean Wauquelin presenting his Chroniques de Hainaut to Philip the Good by Rogier van der Weyden, the cloth continues over the seat, and to the floor. 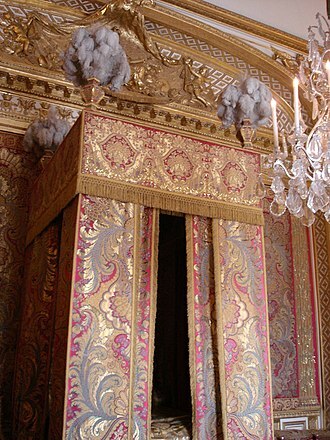 The canopy of estate may still be seen in most formal throne rooms, louis XIV developed the rituals of receptions in his state bedchamber, the petit lever to which only a handful of his court élite might expect to be invited. 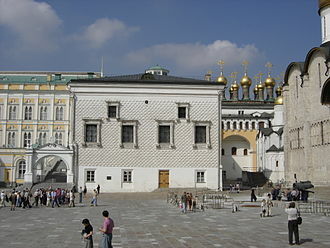 It is part of the tsars palace in the Moscow Kremlin. 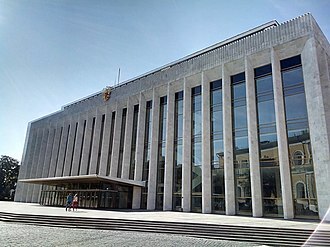 Золотая Царицына Палата is the name of the building houses the chamber. The Chamber was part of the complex built in the Kremlin in late 15th. 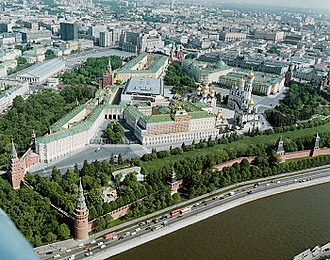 The tsarinas quarters must have located in that part of the palace. It is situated on a floor and was built in the early 16th century. In the 1580s, it was rebuilt as a reception room of Tsarina Irina Godunova. 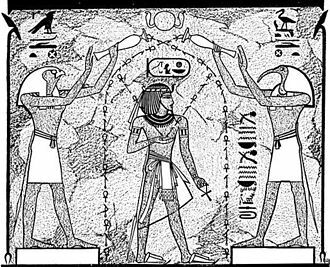 The names of its builders are unknown, it may be assumed, the walls of the chamber are decorated with paintings on a golden background. 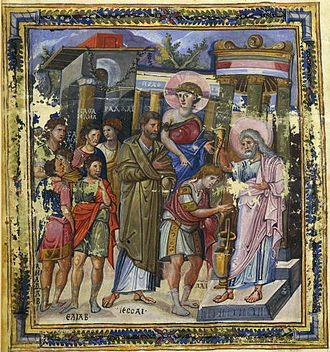 The paintings on the show episodes from Christian history associated with Emperor Constantine of Byzantium and his mother. 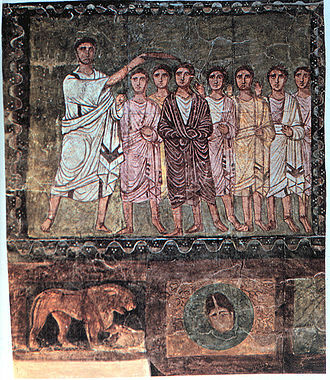 Shown on the wall are scenes from the Life of St. Dinaria. The paintings on the western wall feature scenes from the life of Empress St. Theodora, the Anteroom or Passage Chamber is adjacent to the west side of the Tsarinas Golden Chamber. In the early 17th century, it was named Zhiletskaya because the palaces resident guards, during the four centuries of its existence, the Tsarinas Golden Chamber underwent a number of structural alterations and its frescoes were repainted more than once. 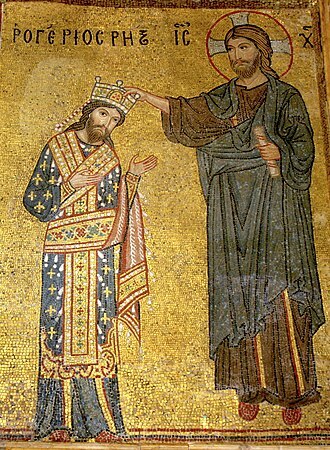 A fresco showing Byzantine emperor Michael III and Patriarch Photios putting the veil of the Theotokos into the sea.